Last winter the most remarkable thing happened. In early December we received about a foot of snow and then for the next four weeks—maybe a bit longer—the temperature never floated much above 15 degrees; most days it hovered around zero. The air was dry and abundantly clear and sharp against the back of the throat. And as the arc of sunlight shifted through the day—and with the moon in the evening and night—the effect was brilliant. Each day I’d go to trails near my home, packed by the few people who run, bike, and walk them so that the snow was solid, yet due to the dry air,spongy. Gone were the many rocks that make the trails look like dry creek beds. Instead, it was a smooth, narrow lane winding through hardwoods and conifer stands. Because the sun set early as we approached the winter solstice, my runs were lit by an incredible, fading butternut light that shifted to a soft purplish red that, again, as night came on, deepened into what could only be described as a Maxfield Parrish blue. The moonlight rising up from the east lit the snow and by the end of my run, the world was transformed. 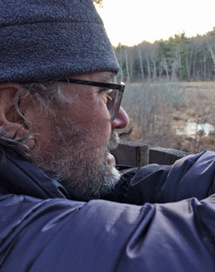 In January, as winter is wont to do in New Hampshire, the weather turned, and the temperature floated above 20 and then 30 degrees. The snow softened and dissipated, it rained for a few days, then a couple weeks of snowstorms followed by the fading of winter in March. The air and countryside didn’t return to the Parrish blue. But hopefully, it will again in a few weeks. If like me you enjoy such weather, then I imagine you enjoy returning to a warm home with family and projects and time beneath the covers reading. We hope that this winter’s issue provides some food for thought and a few good reads. John Gfroerer writes of Omer Marcoux’s oft complaint, la grippe. Shanti Douglas describes how she creates a sense of emotional hygge during winter. Ray Carbone tells a local black history story that perhaps most in our area know little about. Lisa Ballard takes us on a beautiful cross-country skiing adventure in Jackson. And Hillary Nelson describes winter’s cornucopia—found at local winter farmers’ markets—and shares a few recipes to warm any belly after a day in snowy woods. Of course, there’s more. So please, read on, enjoy, and if you have a moment let us know if you have a story to share with us.